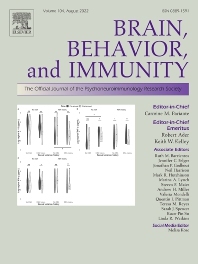 Brain, Behavior, and Immunity, founded in 1987, is the official journal of the Psychoneuroimmunology Research Society (PNIRS). This innovative journal publishes peer-reviewed basic, experimental, and clinical studies dealing with behavioral, neural, endocrine, and immune system interactions in humans and animals. It is an international, interdisciplinary journal devoted to original research in neuroscience, immunology, integrative physiology, behavioral biology, psychiatry, psychology, and clinical medicine and is inclusive of research at the molecular, cellular, social, and whole organism level. The journal features online submission and review. Manuscripts are typically peer-reviewed and returned to authors within 30 days of submission, leading to timely publication of experimental results. There are no submission fees or page charges for Brain, Behavior, and Immunity, which is published eight times a year. Detailed instructions for authors can be found at http://ees.elsevier.com/bbi/. Stress and immunity, including the role of stress-related hormones and neurotransmitters on the immune system.